Are you guys ready for something spicy? Something healthy and savory and delicious? Good, I have just the thing. Let’s make Jalapeño Hummus, yo! This hummus is inspired by all things yellow and green. Also, by my love of spicy food. My dad raised me right on jalapeños and black pepper blanketing everything. Literally, a blanket of pepper. Thankfully, I’ve also persuaded John to jump on the spice train. At this point it’s an all out competition to see who can win the spice off war. Somehow, John’s winning. Hopefully this hummus puts me back in the lead. This recipe requires about 10 ingredients and 30 minutes start to finish. It begins with roasted jalapeños and garlic cloves. 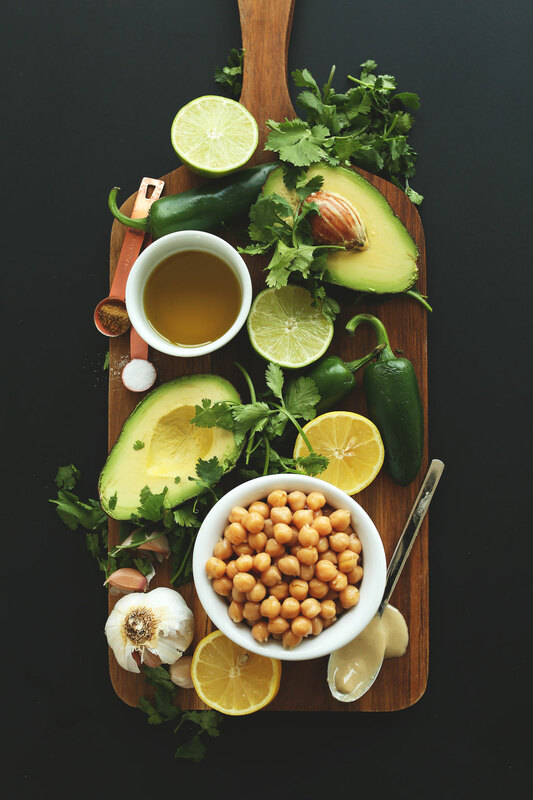 Then, simply add all your other basic hummus ingredients like lemon (and lime! ), salt, pepper, tahini and a few additional spices and you’re in hummus heaven! I even threw in half an avocado for even more creaminess and nutrients. Tasty nutrients for the win. An optional step is to roast up some pumpkin seeds with cumin and sea salt for an extra crunchy bite. This also makes you look super fancy, so it’s kind of a win-win. If you make this recipe, let us know! Leave a comment or take a picture and tag it #minimalistbaker on Instagram so we can be hummus buddies. We LOVE seeing what you guys come up with. Cheers! 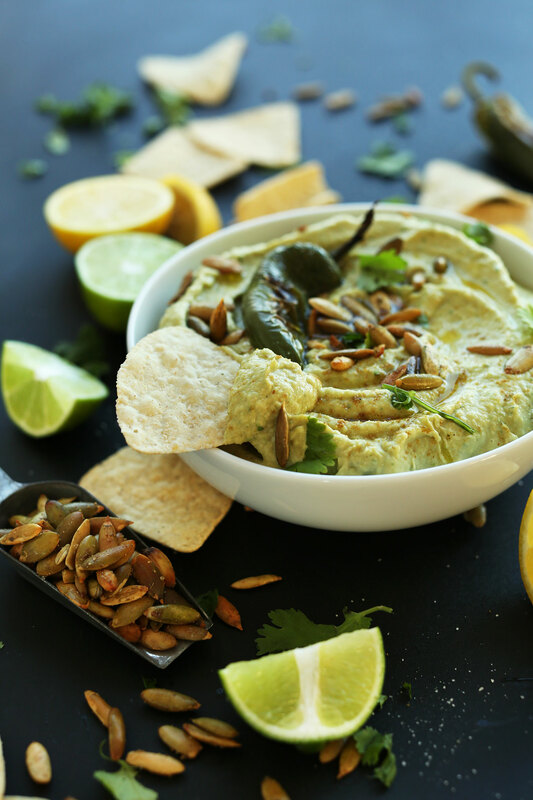 Super creamy roasted jalapeno hummus with simple, wholesome ingredients. Creamy, savory and subtly spiced. Place garlic cloves with skin still on and whole jalapeños on a baking sheet. Drizzle garlic cloves with a small amount of oil of choice (avocado or olive are best) and roast for 15-18 minutes, flipping jalapeños once to ensure even roasting. If the garlic cloves get too roasty-looking, take them out. Once done, remove from oven and set garlic aside. Wrap jalapeños in foil to steam for a few minutes. Then carefully peel away skin and remove seeds. Be sure to wash your hands afterwards! 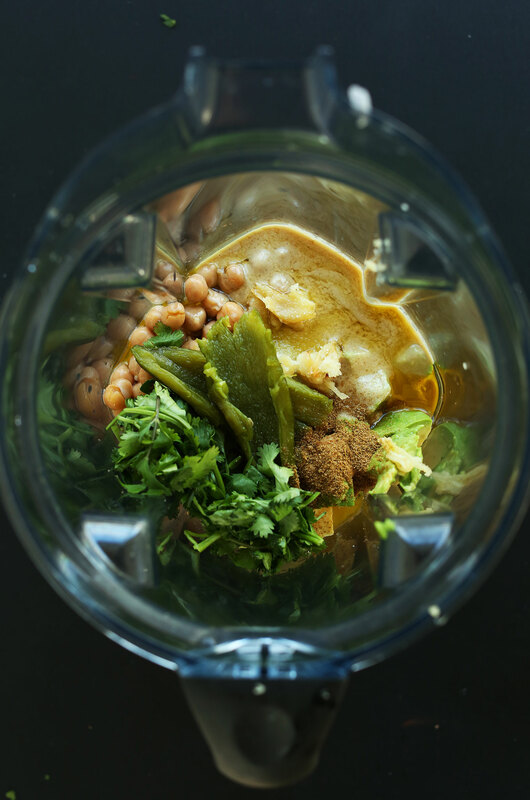 To a blender or food processor, add slightly drained chickpeas, oil, cilantro, avocado, salt, cumin, lime, lemon, roasted jalapeños (start with one and work your way up to desired spice level), tahini and peeled garlic cloves (you should be able to peel away the skin or just squeeze the garlic out). Blend until creamy and smooth, scraping down sides as needed. Taste and adjust seasonings as desired. (I used two medium jalapeños and it was plenty spicy // amount as original recipe is written // adjust if altering batch size). To prepare toasted pumpkin seeds, preheat oven to 350 degrees F (176 C) and toss pumpkin seeds in 1 Tbsp oil + a pinch each salt, pepper and cumin (amounts as original recipe is written // adjust if altering batch size). Spread on a baking sheet and roast for 8-12 minutes. Add to top of hummus, along with another drizzle of olive oil (optional) and fresh cilantro. Serve hummus with veggies, tortilla chips or pita. Leftovers keep well in the fridge, covered for up to 1 week, though best when fresh. *Nutrition information is a rough estimate for 1 quarter-cup serving. Recipes yields roughly 8 quarter-cup servings in total. *Recipe (as originally written) makes ~2 cups. This hummus is yell-from-the-mountaintops good. I LOVE spicy food, so I opted for three jalapenos, and it definitely makes my nose run! I may just use two next time….! I followed the recipe exactly. It turned out light, bright, and delicious. Roasting the garlic is such a great idea. I’ve been searching high and low for a jalapeño cilantro hummus, a la That-Trading-Grocery-Store which shall remain nameless. My closest one is about an hour away. Not too crazy far, but my work schedule is a bit erratic, so satisfying a craving is not always easy. I found your recipe the other day, and I couldn’t wait to get the ingredients on my day off. I had the feeling this was going to be it, and you know what? It IS!! I made this recipe today, exactly as written. The only place I had to improvise was with the roasted garlic and jalapeño since I do not have an oven. I figured I’d try my air fryer, and it worked! (about 9 minutes at 390*F). I forgot to get pita, and I don’t usually eat chips, so I used regular flour tortillas cut up into large pieces. I warmed them up in my toaster for a few seconds to soften a bit, and O. M. G. I was right, this is THE recipe I was looking for!! I WAS going to make tacos tonight, but I just texted my husband and suggested he get Chipotle for himself because the “taste test” turned into dinner for me. Thank you! Franny, we’re so glad you enjoyed this recipe! Thanks for sharing! Delicious! I used three serrano peppers and left most of the seeds inside. It turned out with the perfect spice level. I used two limes and they added a nice tang. Yay! Thanks for sharing, Alexandria! I have successfully made homemade hummus before and was excited to try a jalapeno variation but unfortunately, for me this came out a runny mess. I followed the recipe exactly (but left out the optional avocado) so I’m not sure where I went wrong. Maybe didn’t drain the chickpeas enough? Hmm that may have been the case, Hannah. If you try it again, ensure you drain your chickpeas well! I make this hummus every week. I LOVE it. I wanted to try making a black bean hummus. Do you think I could sub black beans for chickpeas in this recipe? Or would the consistency be off? A lovely hummus, very flavourful. I absolutely love this hummus. I make it every week and eat it for lunch. It’s amazing. 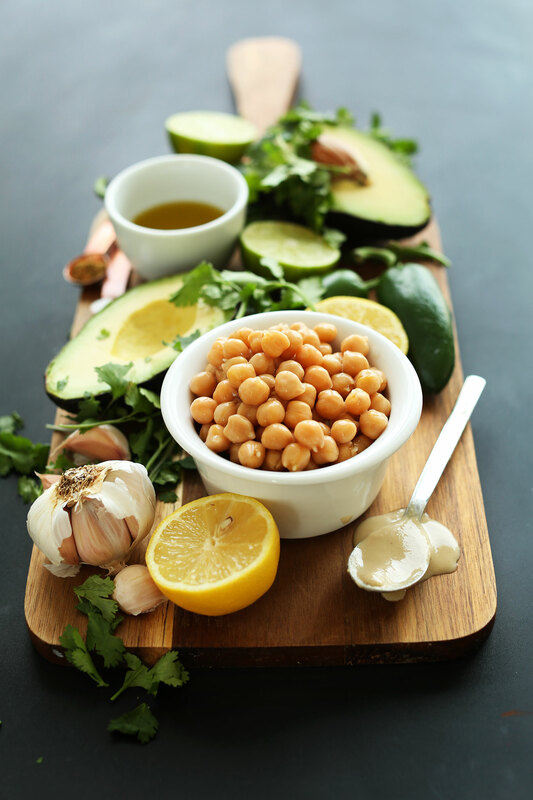 I was told by my health coach to eat more legumes, this makes that so easy! Thank you for sharing. Just made this and eating as I type. Love it!! A nice change from a classic hummus recipe. I made this hummus two days ago and I am in love, and looking for any opportunity to include it in what I am eating. It is so creamy, almost mousse-like with the avocado. The spiciness is perfect. I made it exactly as the recipe states. I have eaten it with broccoli, cauliflower and corn chips and salsa. Can’t wait for a potluck to come up so that I can share this with friends. Dana, I have made so many of your recipes and none have disappointed. Thank you for the blog and videos. I’m a huge fan. Amazing! Made for Super Bowl. Doubled the batch and it made a ton. How long will it last in the refrigerator in a mason jar? Glad you enjoyed it, Lisa! Stored covered, it will last for up to 1 week! How spicy is “spicy” in this recipe? Is it ok for people who have a moderate tolerance for spicy food? I made it with one jalapeño and it gives flavor but not a lot of heat. You can continue to add and blend slowly to your taste. This is my favorite hummus recipe! I used two jalapenos, no avocado. It was perfectly spicy. I’m even going to make it for Friendsgiving. *I used two jalapenos, with the skin and seeds. I make this recipe on a weekly basis. So good for dipping with roasted veggies. Also, amazing on toast with avocado! Thank you Dana! This hummus is delicious! I love the roasted jalapeños and garlic, the addition of avocado and the crunch of pumpkin seeds! I can’t stop eating it! Thanks for this awesome recipe!! Hi! We haven’t tried it, but it should work! Here is a guideline on freezing hummus. Hope this helps! Insanely delicious! Would never have thought to roast the garlic. Totally mellowed out the pepper and the garlic. I had Hungarian peppers in the garden so used those instead of jalapeño peppers. Thank you – love your site! Looking forward to whipping this up over the weekend, thanks again. I am making this as we speak. I did not have any cumin so I used a little bit of smoked paprika and chili powder instead. I am sure that is going to turn out wonderfully. Thank you very much for sharing your recipe! I love this hummus! I’ve been making it for the last few weeks; it’s so quick, easy, and delicious. Only change I make is that I use less tahini (I really don’t like the taste) and, instead, use liquid from the can to make it a little more creamy. This hummus was amazing! I used three jalapeños and it was a good spice level for us. I served it with tortilla chips and it was addicting. I made this yesterday and it is hands down the best hummus I’ve ever had, store bought OR homemade. My husband loves it. My son who is a self proclaimed hummus hater said “that’s hummus? Can I have more?” I took some to my mom who likes hummus, but “only the first couple of bites” said she wanted the recipe with her mouth full of the 10th bite, one she caught her breath after all that mouth shoveling. So, it’s amazing. However, I used everything in the recipe to the letter without the optional cilantro, including 2 huge jalapenos, and it is not even mildly spicy. I like spicy. I expected spicy. I want spicy! Should I try leaving in the seeds next time? Has anyone else had it come out tasting wonderful but not spicy? PS I will definitely be sharing this with all the health foodies in my woman’s boot camp, spicy or not! Problem solved! I made it again with a large jalapeno, a serrano, and a habanero. Definitely some kick this time. I will be keeping some of this on hand at all times. Thank you Dana. This is what happens when guacamole and hummus get married ! Made this exactly by the recipe and I love it. It makes an excellent condiment for my veggie sandwiches. Thanks again for another home run recipe. Forgot to add the stars !!!!! This looks amazing and I was thinking of making it for Thanksgiving. Will the avocado cause the hummus dip to turn brown before Thursday if I make it two days prior? It will turn color a little, but not much. Make it as close to the day of serving as possible! I was about to ask the same thing — making it for a potluck and want it to look appetizing at lunchtime tomorrow but would need to make it tonight. Do you think leaving the avocado pit in the hummus overnight would help, like it does with guac? I’m usually lukewarm on hummus, but I can down an entire bowl of this in one sitting! I do one mod: an entire avocado (just because I’m lazy like that). Yay! Glad you enjoyed it, Jennifer! Holy moley, lady!! I just made this and it was amazing. I used three jalapeños and added an extra clove of garlic. I left out the avacado bc I’m not a huge fan. I’m embarrassed to say, I just ate an entire cucumber scooping this up! Totally stuffed and impressed! (PS This was only my second time making hummus. My first try, using a different recipe, was disgusting, so I was nervous time even try this. So glad I did!) Thanks!! Whoop! So glad you enjoyed it. Thanks for sharing, Meredith! I’m not one to leave comments but this is AMAZING! My mind is blown. I used the avocado and a little bit more beans but other than that exact . My life is forever changed! So kind! So glad you loved it, Tara! Wonderful! thanks for sharing, Samantha! First recipe I’ve made in my first home. This was seriously the BEST… Thank you! Ah, yay! Happy home coming! This is AMAZING! I didn’t have cilantro on hand so I omitted the cumin (personal preference, I like them together). The mellowness of the roasted garlic paired with the medium heat of the roasted jalapenos (I used 2 medium sized ones) is perfect. I also added the zest of the lemon and the lime before I juiced them, really made it pop. I only regret that I did not double the recipe! Wonderful! Thanks for sharing, Chuck! I finally had time to try this recipe, it’s amazing. I made a few modifications, I put elephant garlic (roasted) and an entire medium size avocado, and added more lime and its’ zest. This will be probably the “way” I will make hummus. I also thought about putting a Hawaiian spin to this hummus and putting roasted macadamia nuts and oil on top. great idea with the macadamia nuts! Love! I made this for lunch today and it was amazing. I used fresh jalapenos from my garden and left out the avocado. Thanks for sharing such a well-balanced and tasty recipe! I made this today. Delicious! I didn’t add the oil and I cut the tahini in half (to lower the fat) and it’s still delicious. Very creamy with the avocado. It sure helps to have a Vitamix, too. This is a dream come true! I love jalapeño hummus BUT the only one I can find in Australia has preservatives. :( Now I can make my own, and I’m sure it’s a million times tastier anyway! Thank you, can’t wait to make it! This looks amazing! With a kick! Wow sounds delicious, I love jalapeños and I love hummus so these should be a match made in heaven!!! When you say “1 lemon + 1 lime, juiced” do you mean to squeeze the juice of the lemon and lime into the food processor? Or to squeeze the juice from the lemon and lime into the sink and add what’s left of the fruit to the food processor? add all of the citrus juice to the food processor. Love the recipe! I’ve never thought of using jalepenos. I’m definitely adding that one to my hummus next time! This looks delicious, and so different from other hummus recipes I’ve made. Thanks for sharing! vegan/vegetarian. When will your print cookbook be available and will it include all of your past posted-delicious recipes? I can’t wait to buy it. Thanks for all your hard work, it has helped us eat better. I made this tonight. I skipped the veggies and tortilla chips and just ate it with a spoon right out of the food processor bowl – it’s that good. Thanks for an amazing recipe! Yay! Thanks for sharing, Michelle! I don’t even like hummus that much (I know – I’m crazy), but this looks ahhhmazing. Love hummus! So many creative ways to make such a simple dish, and yours looks great as always. Can’t wait to try. WOWZA! What gorgeous pictures!! 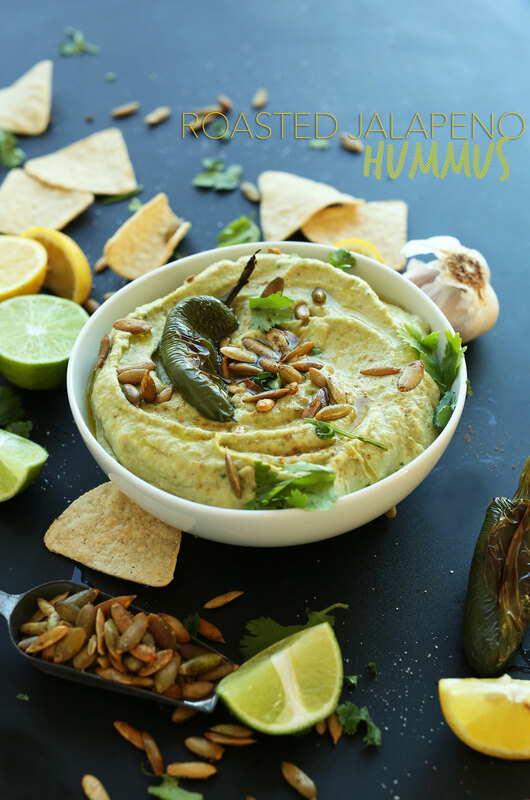 Yum, I just made roasted jalapeno hummus but with white beans! This looks better though :P Pinned fo sho. And once again – I am definitely not a hummus lover but YOU have totally just changed my mind! Definitely trying this over the weekend! Two options for pensioners, or singles would be very useful. Thank you very much. You could do the other half with jarred roasted red peppers. I have had roasted red pepper hummus and it is delicious. I just made an avocado hummus, but love your idea of the roasted jalapenos added. Sounds delish!! Can’t wait to try it. I think I will even leave the seeds in at least 1 jalapeno. Thanks so much. Wow all my fave things in one recipe – I am making this at the weekend! Thanks Minimalist Baker, another great recipe – keep up the good work! This hummus is happening ASAP!!! Actually going to make this on the weekend- I am obsessed with all things spicy and always add hot sauce/red pepper flakes to hummus- This is just so much better! These photos are beautiful! Great job! Well this just looks divine! Thanks for sharing! 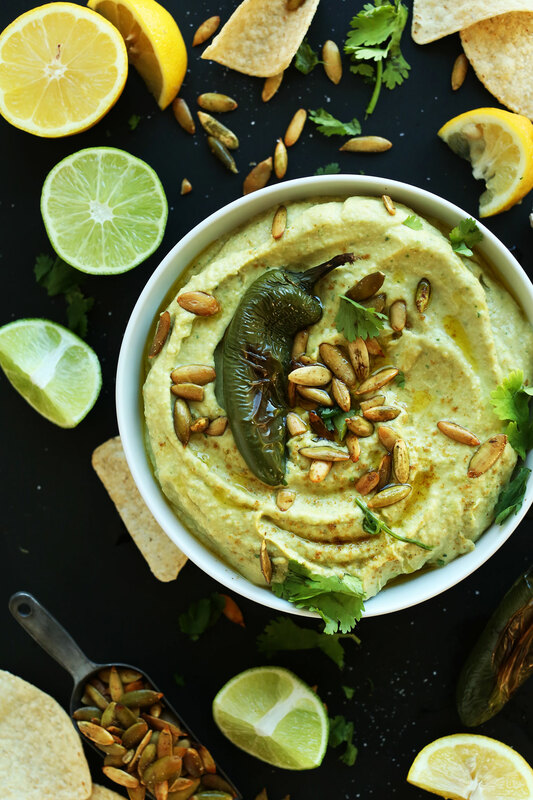 This hummus is basically all my favorite foods conveniently tucked into one recipe! I can’t wait to try this. Your presentation looks truly gourmet. Hi Dana, this recipe looks delicious, but I do have one question for you. Is this hummus super spicy? I like spicy foods every now and then, but I don’t eat foods that are really spicy. I like Frank’s Red Hot hot sauce, but I don’t typically eat super spicy foods. I think this recipe sounds so yummy and would like to give it a try if it’s not too hot. It isn’t! Just add 1 jalapeno at a time and test as you go. I fed this to a crowd and nobody complained of spice! I know I must have an extremely high tolerance but I just don’t find jalapeños spicy at all. LOVE the flavor of them though! Your photos are absolutely gorgeous, by the way. When roasted, I think they get spicier! This hummus is calling my name! Send some my way, pretty please? This may just be the way I can get my guy to eat hummus!! I can totally see using this in a roasted veggie wrap YUM!!! haha, trick them with spice! Hope you guys love it. I’m in ! ! I’m all about spicy food too… so this one is just what I needed! Thank you Dana! Easy to whip up in the Vita and soooo nourishing too! Woooo Hooooo!! I am always ready for something spicy! 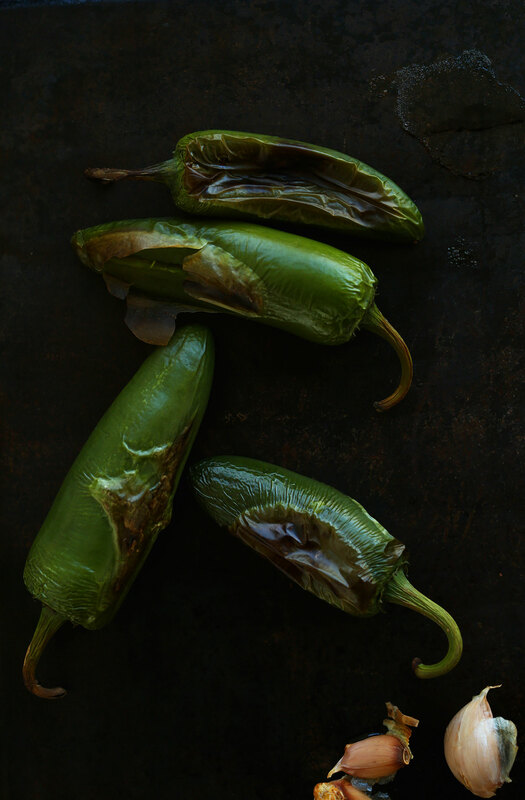 I love roasting jalapenos, it adds of lovely smokiness, which I adore. Again, you guys just hit it out of the park with this blog. I am following a few food bloggers, but you’re the most consistent on sharing recipes and they imagery is a work of art! I cannot wait to come back and give a comment how this taste! So kind! Thanks for the support! OMG We were just in Boulder this weekend and stopped at Midnight Sun Brewing and had a flight of their amazing beers, and their Roasted Jalepeno/Honey hummus. We were fighting over who got to lick the bowl.. and I was wondering how I could ever recreate it… And then you post this! Fate that what this is! Nice! Next time we’re in Boulder we’ll definitely try it! This is my dream hummus! There’s heat and it’s like taking the best of guac and hummus, and blending it into one. I am totally making this!! Pinned! Oh, these photos are stunning! Your styling skills amaze me. And yum!! This hummus looks delish. My husband and I go through hummus like nobody’s business. This will be added to my list of ideas to jazz it up a bit! cor blimey…yummy in my tummy! Those photos are perfect! Nearly made me dribble. This made my mouth water instantly! Must try this! I freaking love hummus! I’ve been eating the tribe and sabra versions for a while but their aren’t too many options or them. I’ve never had a roasted Jalapeño hummus before, but I have a feeling it will be really good! I think you’ll like it, Channing! It’s my new fave. Thanks for saying hi! 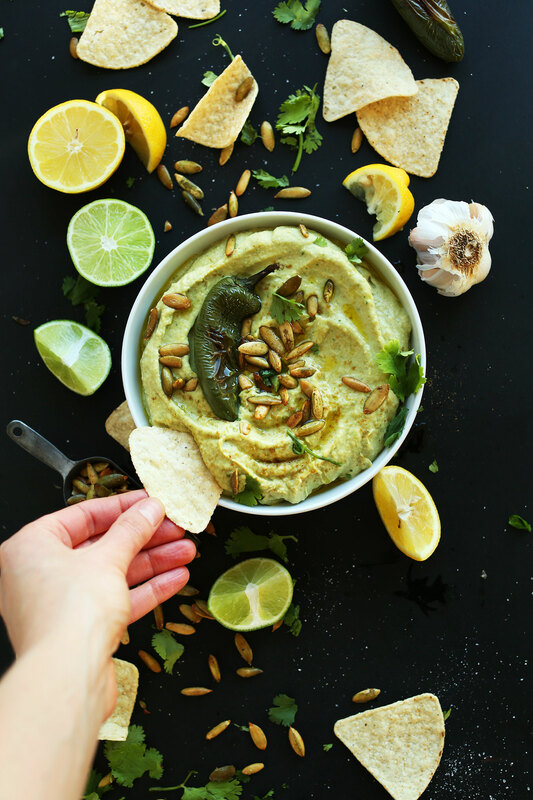 I totally posted a green hummus recipe today, too! 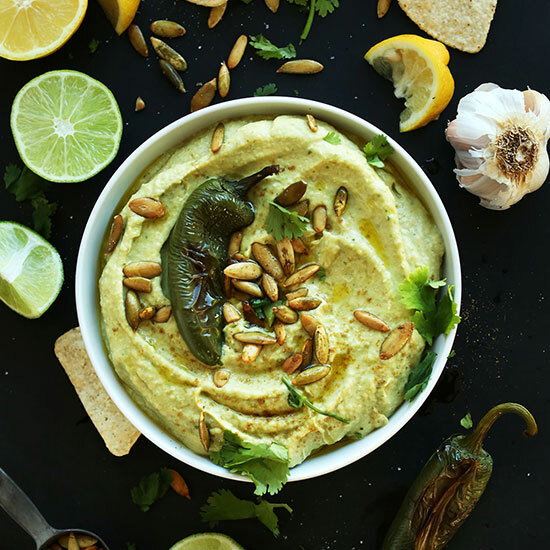 This roasted jalapeno hummus, though? Amazing. A little spice never hurt no one :) Pinned! WHAT? This is amazing, seriously! I am in awe of this recipe and I am trying it ASAP! You should definitely try it, friend! I love some kick in my hummus. This sounds awesome! Yeah, I love kick in my food too (Frank’s Red Hot sauce anyone) but the wife’s not a fan. So in the past, she won’t dedicate any space in our garden to jalapeno’s. So I’m going to show her this recipe and say, “Ok, we can compromise, I’ll try hummus for the first time if you’ll try the jalepeno in here” But that reminds me the last time we compromised……I didn’t want a cat……she wanted a cat….so we compromised and got a cat! And now I’m a cat man. See, people can change. I just made this hummus. I normally do not like homemade hummus. This is to die for! My tastebuds are in overdrive right now. I had to put it away. I could not stop eating it.